I don't know in past whether you heard the news of hacking of twitter accounts, Ok! i will remind it again for our new readers. Twitter is one of the biggest and fastest growing social media site. According to recent stats of April 2013 twitter hits stats of 500 million users. This micro-blogging site is being widely use by people of fields including celebrities which have millions of active followers. But anybody can believe that in last year twitter has faced multiple of severe attacks by hackers and around 0.3 million users lost their accounts. In 2-3 February 2013, passwords and other private information of around 250K is stolen by anonymous . And the similar type of incident was also happened in May 2012 with 55k twitter users. And according to latest news somebody unlocked Associated Press (News Source) twitter account and tweeted the fake news of injury of Barack Obama in multiple bomb blasts in white house. Anonymous tweet this bogus news via AP profile with there 20 million followers. Obviously it became viral in minutes and created lots of confusions. And it was being noticed that majority of accounts including AP's are being hacked by using a simple technique known as Phishing. And it is also being noticed that majority of accounts are using quite common and weak passwords. 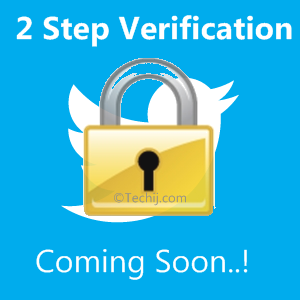 Well I think Now the time has come that Twitter will also introduce system likely 2 Step Verification. This is quite effective system in which with username and password, user must have to insert a verification code which is different for each sign in and user get it via message on mobile number. Currently Google and Microsoft both are using two factor verification system for their all products. And a good news is that Twitter hired a software engineer in Feb 2013 after 2nd Feb incident for designing and developing security features.